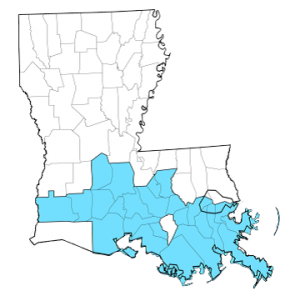 The federal government designated the Louisiana Chemical Corridor – a 200 mile stretch of refineries and manufacturing facilities located between Lake Charles and New Orleans – as one of the 24 new manufacturing communities through the Investing in Manufacturing Communities Partnership (IMCP). The designation will help grow businesses through a collective impact approach, integrating technical assistance in business excellence, sustainability, safety, workforce development, and more. To see more about LCMI’s initial IMCP application, click here. 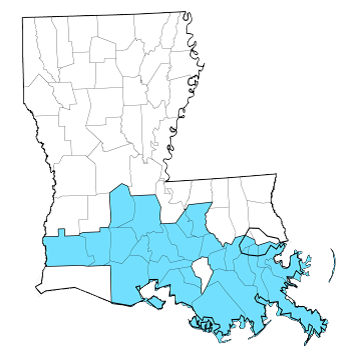 South Louisiana is internationally known for its chemical manufacturing and abundant supply of natural gas and petroleum. The “chemical corridor,” spanning 200 miles from New Orleans to Baton Rouge and Lake Charles, is the home of hundreds of chemical manufacturing facilities and refineries worth billions of dollars. The high international demand for petrochemical and energy-related products has created a network of key technology and supply chains (KTS) deployed for building, operating and servicing these facilities. Advanced industries including manufacturing, energy and services sectors together employed 255,920 full time workers (direct plus indirect jobs), produced $60.6 billion in output and accounted for 27.3% of all output in the region in 2013. While demand continues to grow, this industry is experiencing a shift toward more sustainable resources and practices worldwide. The goal of the South Louisiana Chemical Manufacturing Community, led by Louisiana State University, is to develop a vibrant nationally and internationally known chemical manufacturing community that increases positive social and environmental impacts, including job growth, waste reduction and product innovation. This healthy, regional chemical manufacturing sector will provide the rest of the country with a stable supply of innovative chemical products that feed the downstream manufacturing of consumer goods for the U.S. and international markets. The partnership includes experts in sustainability, workforce development and small business development, in order to truly build an integrated approach. The IMCP designation will provide the broad partnership of more than 80 organizations with new opportunities to build on its strength and to make South Louisiana even stronger for many years to come. View a full list of our partners here. The IMCP is led by a core group of organizations. To learn more about them, click here.